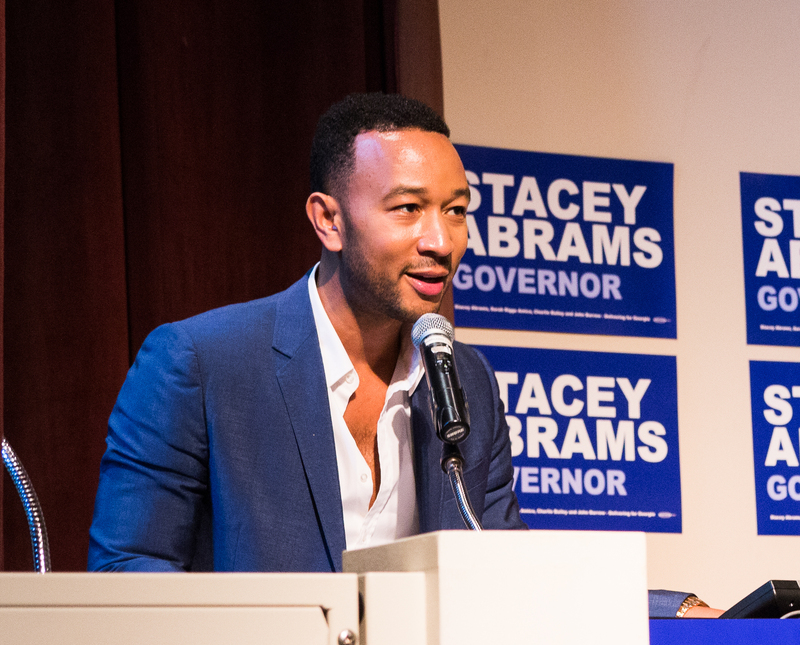 Singer-songwriter John Legend campaigned for Georgia Democratic gubernatorial candidate Stacey Abrams in Harland Cinema on Tuesday. Legend addressed about 160 students and community members, some of whom waited hours to attend the event, which was hosted by student group Young Democrats of Emory and the Democratic Party of Georgia. The award-winning artist, who has ramped up his political activism since President Donald J. Trump’s election, spoke about Abrams’ background from humble beginnings to obtaining a Yale University (Conn.) education and influential positions in Georgia state government. Legend, who became the first African American to win an Emmy, Grammy, Oscar and Tony (EGOT) this year, said in an interview with the Wheel that artists have a connection to their audience that gives them an ability to engender meaningful influence. Legend added that U.S. senators are sending a “frightening” message to students as they consider Judge Brett Kavanaugh’s nomination to the Supreme Court because Republican leaders are diminishing the negative effects that men’s “bad behavior” can have on women. Following his talk, two Abrams campaign staffers joined Legend on stage and the three answered questions from the audience. Benjamin Gross (19B) asked how Legend maintained hope during this time of political turmoil. Legend responded by saying people like Abrams give him hope because she could be part of a “blue wave” for the 2018 midterms. Nicole Swords (19C) asked how to converse with people who have different beliefs. Legend advised that she talk to people about the issues that are meaningful to them rather than the party with which they align. He added one can still love friends with differing beliefs and referenced his friendship with rapper Kanye West, a Trump supporter. Young Democrats Co-President Owen Mattocks (20C) said he thought Swords’ question was particularly important. 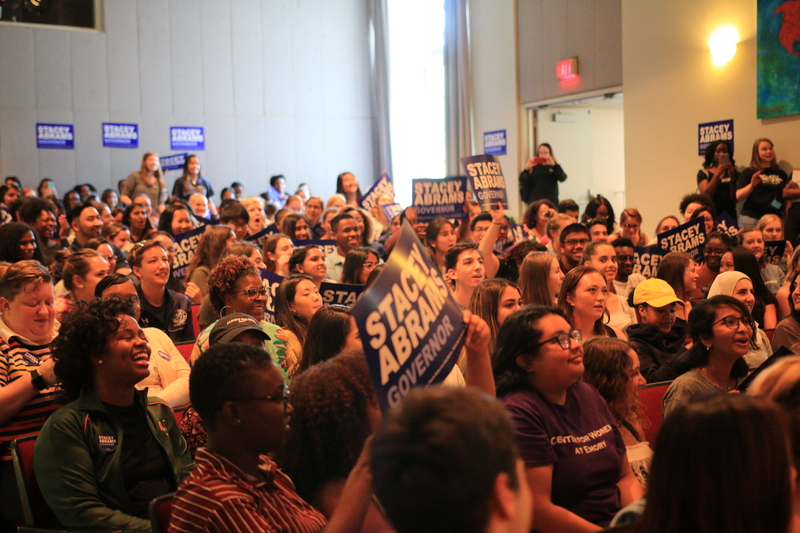 According to Young Democrats Co-President Brett Kleiman (20C), Jovan Paige, director of youth, college and millennial engagement for Abrams’ campaign, emailed Kleiman and Mattocks last week with an opportunity to bring Legend to campus. Legend’s visit to Emory was the second of four Atlanta-area colleges Legend visited on Tuesday. He also visited Georgia Institute of Technology, Georgia State University and Atlanta University Center. In addition to bringing guests to campus, Young Democrats has been canvassing and phone banking. Kleiman said this was a high-profile event for the organization, which has grown significantly in membership over the past two years. “It’s really hard to get people to care really about anything, especially politics in a state they only spend a portion of the year in, but having someone that’s so enthusiastic and charismatic like … Legend really gets people fired up,” Mattocks said. Haaris Jamal (21C), who attended the event, said he was excited to hear what Legend thought about Abrams. “I liked that [Legend] seemed really passionate about the issues, and I feel as though it was really nice to see [Abrams’] campaign team sum up the core issues of current American politics,” Jamal said. [email protected] | Alisha Compton (19C) is from Chantilly, Va., majoring in neuroscience and behavioral biology and English, with a concentration in creative nonfiction. She previously served as Emory life editor. In addition to the Wheel, she is an undergraduate research assistant at the Grady Trauma Project, a member of the Survivor Anthology and a sister of Gamma Phi Beta sorority.